Chinese conglomerate plans to open dozens of the automated retail outlets in China next year. In brief: Alibaba will sell Ford's electric vehicles via enormous automated vending machines. The company plans to open dozens of facilities across China over the course of 2018. Retail giant Alibaba has inked a deal to market electric vehicles built by Ford in China. The company plans to use a massive vending machine in order to facilitate sales. Customers will scan a car that they’re interested in using the Taobao shopping app developed by Alibaba. They can then pick a color, enter some basic information and take an all-important selfie. Said selfie will be used to identify the individual when they head over to the unmanned vending machine. Facial recognition technology is used to match the person with their order, and the corresponding vehicle is taken out of storage. At this point, they have three days to test the vehicle in order to determine whether they want to make a purchase. When they’ve made up their mind, they can take to the smartphone app to pay for it, or to arrange to return the car and schedule another test drive. Customers are limited to five test periods every two months to ensure the system isn’t used as a free car hire service. Moreover, they need to qualify as an Alibaba Super Member, and have reached a certain level on the company’s credit scoring service. This isn’t the first time that we’ve seen an automated car dealership, and it’s not the first time that Alibaba has sold vehicles. However, the heft of this particular retailer means that it could feasibly roll out these vending machines on a large scale – and it certainly seems eager to do so. Alibaba plans to open two facilities in January 2018; one will be situated in Shanghai, while the other is set for Nanjing. Assuming they are a success, the company hopes to introduce dozens more across China over the course of next year. 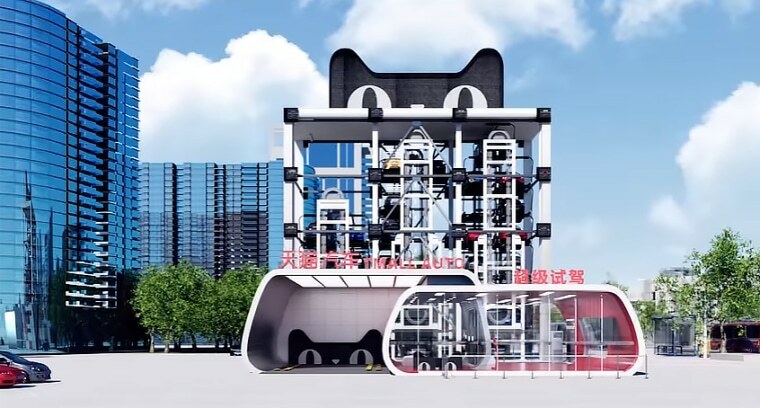 "Alibaba Unveils Plans for an Electric Vehicle Vending Machine" was originally published by Futurism, LLC on Dec. 14, 2017 by Brad Jones. Copyright 2017. Futurism, LLC. All rights reserved.